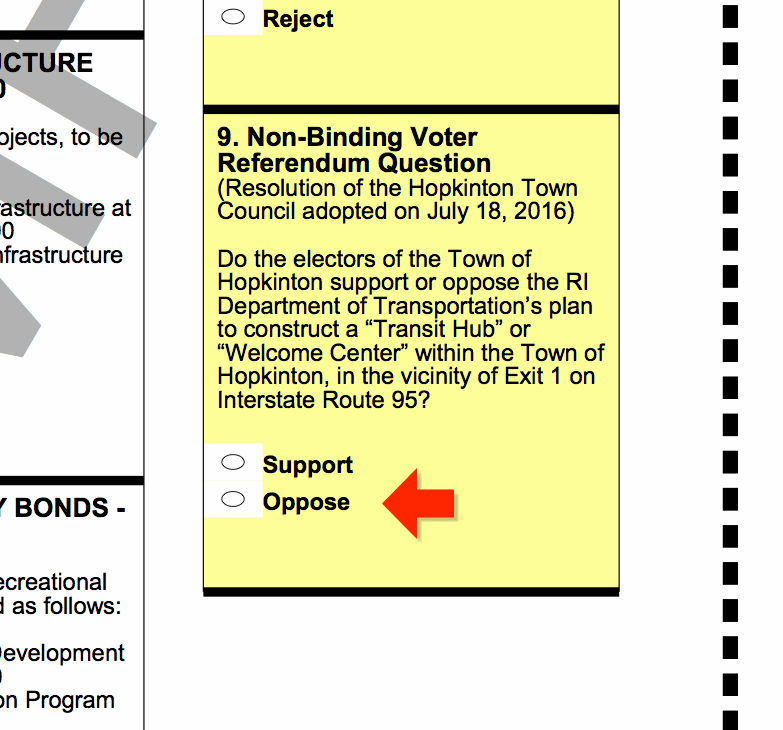 Shown is a segment of the sample ballot for Hopkinton. The complete ballot is available from the Secretary of State office as a PDF file. RIDOT’s proposal outlines what it thinks are good reasons for its $12million Exit 1 rest stop. Let’s review the claims from their grant application. RIDOT believes that people will park their cars at an interstate rest area and then take a bus or carpool to Providence, Newport, and Westerly. This is false. Point 3 is contingent on points 1 and 2. RIDOT asserts that traffic in Warwick will be mitigated by a new Park and Ride at Exit 1. The existing Park and Ride is half empty. Again, RIDOT’s claim is false. False. There is a Pilot truck stop less than half a mile away from RIDOT’s proposed Exit 1 location. How can amenities be “much needed” if they exist less than a minute away? Additionally, Wyoming is just 6 miles away. What travel amenities are missing? Besides, is that how we want to welcome visitors to the Ocean State? Why does #RI aspire to welcome tourists with fast food? What's our message, exactly? 🍔🍟? Or 🍩? That seems like a lousy opening statement. Sounds like claims 1-3 repeated and reworded. RIDOT believes that tourists will drive to this rest stop, leave their cars, and take a bus to Newport or Westerly. Hopkinton has only one bus route, it only runs one day per week, and it doesn’t go to Newport. Hopkinton’s Comprehensive Plan, which must be approved by the State, calls for increased eco tourism. Specifically hiking and biking. Building a secure bike rack at this interstate rest area will not help because Route 3 is not suitable for biking. I believe this ratio is calculated primarily on the notion that there is a 100 mile gap in highway facilities. But again, that claim is egregiously false. I’m certain that their ratio requires recalculation based on honest evaluation of fact. This author may not be qualified as an engineer to do the correct calculation for RIDOT, but he doesn’t find it credible given the rest of the report. It doesn’t serve the Town of Hopkinton, nor the State of Rhode Island. Vote Oppose on Question 9. Contact your representatives and tell them to stop plans to build their rest stop. Join hundreds of signers of the online petition.